If you live in a metro city, specially one like Mumbai - you crave for a time-out to be somewhere peaceful, silent, green, serene. Somewhere you can go spend some quality time with your loves ones, or maybe silent time with yourself or connecting with nature. Ganesh Baugh was one such place I recently visited. Usually family vacations are at some standard luxury resort at Goa or some other tourist location - but tourist locations means crowd, noise, chaos. Now imagine being at a 100 acre lush greenery, living in the middle of trees and farm-life. A standalone basic accommodation with all modern amenities like a hugeee bathroom with geyser, jetspray (yes I need to know if the loo has a jet spray! ), toileteries, bed sheets etc. There is a granite flooring with granite bed and since we went during winter - we did not even need the fan. Unfortunate for us, we spent one whole day traveling as our train was delayed - so when booking tickets, see the delay pattern and then book. If you're coming from Mumbai Kutch Express is a good option. Nearest railway station is Anjaar, but that is a small one where not all trains halt, so then there is Gandhidham junction which is half an hour away. We reached on Friday night and after hours in the train, we could not wait to reach and have some hot home cooked food. The owner Mr.Bhatia and his staff was awaiting us and there was hot traditional Gujarat food awaiting us - Gujarati kadhi, sev tamatar nu saak, khichdi, chapati, chaas and some salad. We ate to our heart's content and turned in for the day as we wanted to rest up for the hectic day ahead. They have a proper functioning kitchen on the upper floor (rooms are on the ground level) - where all ingredients and utensils are there if you want to cook anything on your own. It's a great thing specially if you're traveling with children as you need to prepare milk or something else for them, or if you want to have tea or coffee anytime of the hour or are in mood for the midnight maggi - it's like your own home. Next morning I woke up at around 7am, there was darkness in the room with the doors closed and shaded, and since we arrived at night we couldn't see anything. So now picture this - I open the room doors to see hundreds of trees, chilly air and li'l fog and peacocks and peahens running around! I could not believe my eyes. If you're from a small town or happen to visit villages frequently, you may not be surprised. But I have seen peacocks roaming freely like this only in my childhood days when I visited Jaipur, my native place. So I was so happy. I ran inside to go get my GoPro and record, and those camera shy and maybe human shy birds vanished. We had some tea and got ready for a long day ahead - covering places in Bhuj and then heading to Rann Utsav, read more about that here. We were back late night, after having dinner outside on the way (Hotel Neelam, quite good food - much recommended). We chatted for a while and snoozed again - since we were exhausted. Our earlier itinerary had us on the road for hours again the next day but we did not want to tire ourself, plus being our last day we wanted to spend some time at the farm so we changed our plans. Next morning we got up and had our chai with a bonfire to warm us too - why should bonfires be only for nights, right? It was very soothing and soon we explored the farmhouse to see what all it has. They have ample of fruit trees bearing Guavas, Mangoes (during mango season they get really busy), lemons etc. They also house some domestic animals apart from dogs - like goats, cows, horses. We were even lucky to spot a family of great Indian antelopes (neelgaay) who apparently can jump heights and happen to visit the farm frequently owing to the fact there aren't many humans around. We saw the mother, father and kid (not from near though, from far off) - they are like giant deers (built more like a horse). Mr.Bhatia told us there are deers also which you can sometimes spot. There was a very friendly black lab called Tiger - who even my toddler grew fond of. My toddler also grew very fond of the owner Mr.Bhatia, whom he addressed as "babaji" on his own, he hasn't even heard that word before! Day 2 (technically Day 3) was then spent exploring li'l bit more of Bhuj and then heading to Bhujodi to shop for local handicraft and visiting the Vande Mataram memorial park (a must visit). We bought shawls, purses, copper/brass bells, kurtas etc from here. My only regret was not getting to spend more time at Ganesh Baugh - there was still a lot I did not get to see - like their inhouse nursery, nearby school etc. So I would recommend you to plan a trip with atleast 4-5 days minimum in hand so that you have atleast 2 days just at the farmhouse. They can easily accommodate a group of 10 - so if you're planning to visit with friends or family - they are there to host you. I opted to stay at Ganesh Baugh rather than one of the tent city tents because those are a rip-off, charging a crazy amount for a tent stay, plus it's too crowded and noisy - which I wanted to avoid and ofcourse thanks to Manasvi, our host from Mumbai who told me about this place - thanks a ton! 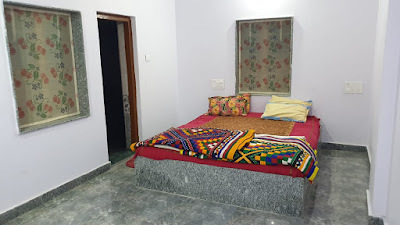 You can book the property online or get more information here - Ganesh Baugh AirBNB.